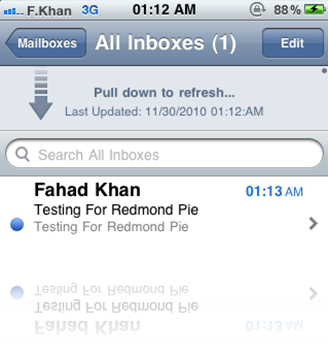 Thanks to a new tweak available in Cydia called “Pull To Refresh for Mail”, you can now just pull your inbox list down past the search bar and your mail will automatically refresh. This has been seen on Twitter for iPhone (formerly Tweetie), various other Twitter clients and more recently the Facebook application. The app is activated automatically when you install it, so there is no icon or settings option. Best of all its free and it is compatible with firmware 3.x onwards, so why not give it a try. 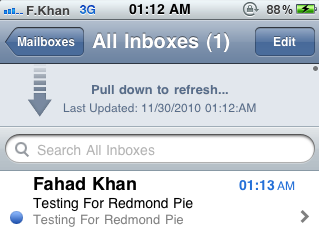 Pull To Refresh For Mail is available from Cydia under BigBoss repository for free.